Sometimes, less is more. Back on October 7, I began a beginner strength training routine in earnest. So far, less is more has been working. I decided to start with only two weight lifting exercises, squats, and deadlifts. And a few additional single joint exercises on top of the squats and deadlifts. Back in October, I was not using any weight, just body weight and working on form. First, reading about the correct form in Starting Strength. Second, visualizing myself doing squats and deadlifts with correct form. I am grateful that as of today, I was able to squat 125lbs for 5 sets of 5 squats and 5 deadlifts of 175lbs. I deadlifted more than my bodyweight. Those are the highest numbers I have ever reached for squats and deadlifts. No one is more surprised than me. A couple of years ago I tried doing squats but could never go beyond 100 to 110lbs tops. I went back to the drawing board to try and understand how best to do squats and deadlifts. I also have done my best to not miss any of the 3-time squat and deadlift workouts. This squat and deadlift workout that I have been doing now for about 10 weeks take about 45 minutes to one hour. I attribute the gains in poundage to current 125lbs for squats to working on having the best squat form possible. Since I did 5 sets of 5 squats today at 125lbs, that means that I am going to shoot for 130lbs on my next squat workout. Regarding deadlifts, I do not believe I am yet ready to go up to 180lbs. I also think that I need to once again review the proper deadlift and squat form as explained in Starting Strength. Bottom line, when you are looking to start an exercise program to find a way to get stronger, consider the idea of less is more. Start with one strength training exercise and build up from there. My recommendation is to start with squats because squats are universally recognized as giving you the most benefits for the time you are going to spend in the gym. And if you are ready to start a squat workout program, consider adding one set of deadlifts to the end of your routine. Of course gets your doctor's approval before starting any exercise program, especially one with squats because they are risky when not done with proper form. 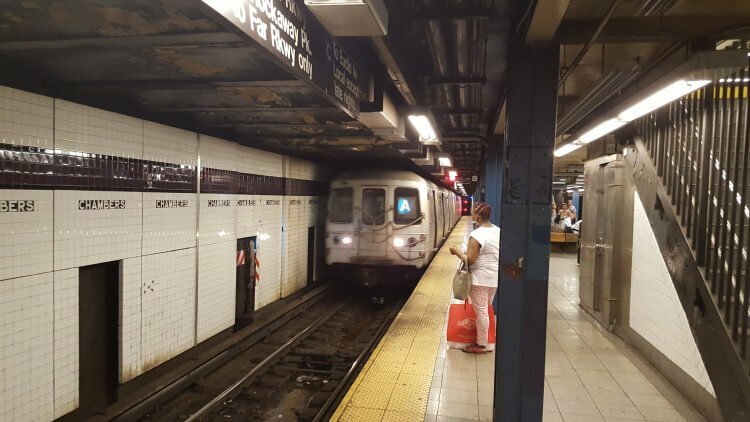 So, What's Up with the picture of the subway? Well, first of all, it is a pic of New York City and I do not need any reason other than that, cause I love the City, having gazed at the City from my apartment for long as I can remember, imagining that there lived the wizard of Oz or some other magicians. Besides giving kudos to the City, there is also the message that the trains can leave us with. Keep your schedule. Stay on your path. Don't give up. This shot was taken at Chambers Street, right near the world trade center, and the trains are still running, so don't give up, no matter what shape you are in now and no matter what your age is. And finally, always, respect the squat and deadlift and remember that less is more.